Can a 6-monthly administered biologic prevent age-related blindness? As increasing numbers of people survive in relatively good health to older ages, the importance of diseases impacting their quality of life rise in significance. One such disease is age-related macular degeneration, (AMD), which in the ‘wet form’ of AMD or choroidal neovascularisation (CNV) is a major cause of vision impairment in the aging population. The basic ‘wet AMD’ aetiology is that leaky, new blood vessels from the choroid, penetrate into the retina and leak blood and fluid: obscuring the macula, which is the major centre of fine vision (acuity). So for many elderly sufferers of wet AMD their quality of life is drastically impacted. They may lose the ability to read or drive. Effective therapies are available to wet AMD sufferers with the advent of intravitreal (IVT) injections (directly into the eye) of biological inhibitors (anti-VEGFs) of the major cytokine driving the CNV and leaky vessel formation: Vascular Endothelial Growth Factor. However, the economic burden for health services able to provide such therapies and to the elderly patients is not simply the cost of the medicine, but the repeated frequent injections, ideally once a month or every two months for efficacy. Fig. 1. 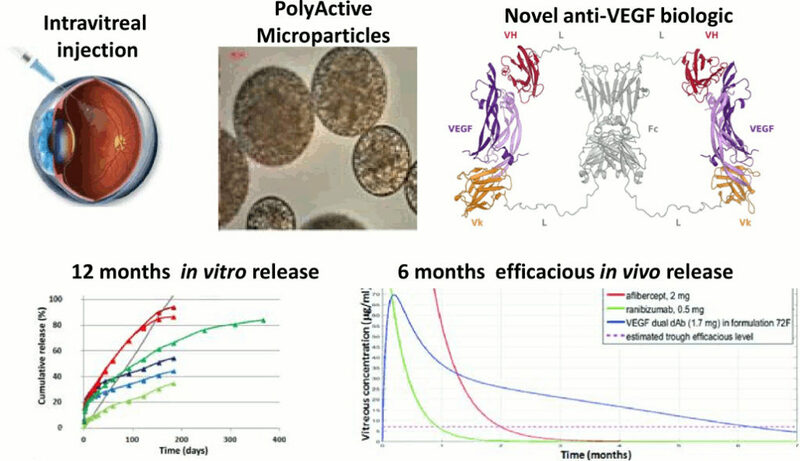 Intravitreal injection of biodegradable microparticles loaded with a potent biologic antagonist for Vascular Endothelial Growth Factor (anti-VEGF) have been show to release biologically active anti-VEGF molecule over 6 months in the Cynomolgus eye. Also protecting in a model of wet age-related macular degeneration, (AMD), after 6 months of release from a single injection. Figure sourced from the Graphical Abstract of the original publication: Adamson et al., in Journal of Controlled Release 2016. All studies were conducted in accordance with the GSK Policy on the Care, Welfare and Treatment of Laboratory Animals and were reviewed the Institutional Animal Care and Use Committee either at GSK or by the ethical review process at the institution where the work was performed. This requires multiple patient visits to Ophthalmology clinics, ensuing travel and time costs for Ophthalmologists, patients and carers. In clinical trials, the correct frequency of injection is adhered to: patient’s vision markedly improves often gaining visual acuity increases equivalent to 2-3 lines of improved vision on a standard eye chart. However, in the ‘real life’ situation, wet AMD patients are offered marketed anti-VEGF therapies which do not adhere to a regime of 6-12 IVT injections per year. The average number of injections per year is 2-3 or even less, and long term stabilisation of the improved vision seen in the ground breaking anti-VEGF trials is sadly not achieved in the real life setting with many elderly patients. Efforts to address the longevity of action of anti-VEGF biologics have been actively pursued and include changing the molecule: to improve both its potency and half-life to reduce the frequency of injection. Using these approaches, an effective 3 monthly regime will reach the market soon. The eye is seen as a favourable organ to apply controlled release technologies to resolve this problem. We addressed many of the challenges of generating a 6-monthly administered sustained release formulation for an anti-VEGF biologic in our recent paper in Journal of Controlled Release. This work demonstrated that it was possible to load microparticles with sufficient amounts of a potent anti-VEGF molecule and inject IVT to show sustained release in a Cynomolgus pre-clinical model of wet AMD over 6 months at sufficient levels to protect eyes. Hurdles were overcome to keep a large protein active over 6 months in vivo. Despite the approach being modelled to deliver clinical success, the Cynomolgus studies highlighted additional hurdles to be resolved: particulate ocular intolerability and resulting inflammation; particle migration to the front of the eye and delayed degradation of the delivery system matrix. Further work needs to move away from particulate delivery systems towards solidifying injectable gels with tuned release and degradation profiles to 6 months in the eye to make this premise a reality in man. Single ocular injection of a sustained-release anti-VEGF delivers 6months pharmacokinetics and efficacy in a primate laser CNV model.